Wall graphics are a great way to enhance your interior design and make your business stand out! As a business, the interior of your workplace says a lot about you. If your interior appears to be old and outdated, that can potentially give off the meaning that your business is old and not in touch with the times. This is why you need some type of interior decoration that adds vibrancy to your business, like wall graphics. 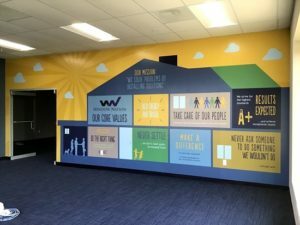 The benefits that come along with wall graphics are great and plentiful, and here are a few examples of just how fantastic they are. Adding wall graphics to your business is a fantastic way to spice up your office. Wall graphics add color, style and texture to your office in a wall that a simple coat of paint and a few pictures on the wall cannot possibly hope to imitate. Something as simple as these graphics can easily turn your dreary office walls into a dynamic feature that people will love. Wall graphics can also serve a practical use at your business that you may not have considered before. Yes, wall graphics can be much more than just mere decorations. You can use wall graphics practically as a form of promotion for certain products or a special deal that you have going on that you wish to advertise. Additionally, wall graphics can even be used to provide directions throughout a building or an event to help people navigate around and not get lost. By choosing to use wall graphics for your business, you are given the chance to customize them to exactly what you want and need for your business. You can personalize your graphics so that they are tailored to whatever you desire to place on your wall. Your options are unlimited, from color to design, because it is completely up to you what you want to go up on that wall. You will also be creating a great atmosphere by adding wall graphics to your business. It creates a fun, enticing, inviting space for you, your employees, and your clients. You will find your business will be more lively than ever before and that the morale of your employees will receive a large boost as well. Call Brand It, Wrap It Today for Your Wall Graphics! If You’re Ready To See What Wall Graphics can do for your business, Brand It, Wrap It is ready to help! Brand It Wrap It, Custom Signs and Vehicle Graphics is a full-service sign and wrap company committed to providing high quality affordable indoor/outdoor custom signage and vehicle graphics solutions to businesses of all sizes in Rockville, Maryland, Virginia, the Washington DC Metro community and nationwide. This entry was posted on Friday, September 21st, 2018 at 11:09 pm. Both comments and pings are currently closed.